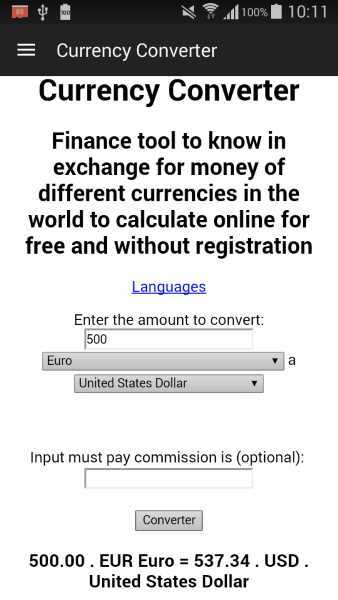 Currency converter for free Android the calculator shows the Price for values currencies both Dollars, Euros, Peso or Pounds. New Currency Converter more easy to use and ease simplicity, The new converter still has a number of advanced features to have it installed on your Android mobile phone or tablet. All calculations are done on the fly at the moment. When Putting the number or quantity of coins will be made an automatic calculation, You can Put the Percentage if you have to pay commission to change. Useful in case you have to leave for Holiday or business trip to know how much is the change of the local Currency. On this occasion converters for the devices that run the Android operating system on both Samsung Galaxy, Htc, Sony, Nokia or Lg. You can see dollars to Euros at the moment without having to wait. For me it is the Best Converter to work with the coins, but I can not speak objectively. This small applications with a number of interesting features. They are easy to use, do not consume many resources for the phone. It is available in many languages of both English, French, Spanish, Russian, Japanese, Chinese and German. Exchange rates are easy to see as it shows only Numbers do not load graphics so you do not consume too much data from your internet connection It would have to work with Android Tablet and Smartphone.